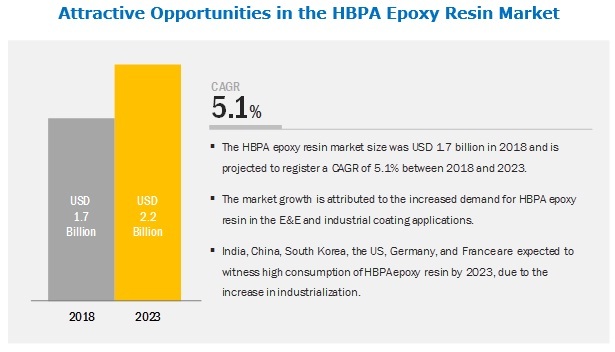 [98 Pages Report] The market size of HBPA epoxy resin is estimated at USD 1.7 billion in 2018 and is projected to reach USD 2.2 billion by 2023, at a CAGR of 5.1%, between 2018 and 2023. The HBPA epoxy resin market is driven by the growth of the power generation industry in developing countries and an increase in the need to protect concrete floors in the industrial and commercial facilities. However, volatility in raw material prices is a major restraint for market growth. By physical form, the liquid segment is expected to be the larger segment in the HBPA epoxy resin market during the forecast period. On the basis of physical form, the HBPA epoxy resin market has been categorized into liquid and solid segments. Liquid form is the larger and faster-growing segment in the HBPA epoxy resin market. It is easy to apply and mainly used in flooring, adhesives, and wind power applications. It is the most widely used resin as it caters to almost every application. The E&E application is projected to be the faster-growing segment in the HBPA epoxy resin market, during the forecast period. On the basis of application, the HBPA epoxy resin market has been segmented into E&E coating, industrial coating, and others. E&E coating is the larger and faster-growing application of HBPA epoxy resin. Owing to its excellent physical properties, HBPA epoxy resin is mainly used as a coating material for high-voltage electrical machines to protect these from external weather conditions and prevent the yellowing of their surfaces. The population growth and rapid industrialization lead to an increase in demand for power generation and distribution infrastructure, which, in turn, drives the demand for HBPA epoxy resin coating in the E&E application. APAC is projected to be the largest market, during the forecast period. On the basis of region, the HBPA epoxy resin market has been segmented into APAC, Europe, North America, Middle East & Africa, and South America. APAC is projected to register the highest growth in the global HBPA epoxy resin market during the forecast period. The demand for HBPA epoxy resin is high in developing economies, such as China and India. The growing urbanization and industrialization are leading to an increase in demand for electricity to fulfill the needs of industrial, commercial, and residential sectors. The rise in demand for power generation and distribution leads to an increased requirement for HBPA epoxy resin in the E&E coating application in these countries. Government initiative for developing renewable energy infrastructure is also fueling the market growth in the APAC region. The key players profiled in this report include Hexion (US), Atul Chemicals (India), New Japan Chemical Company (Japan), Aditya Birla Chemicals (India), Kukdo Chemicals (South Korea), Anhui Xinyuan Chemical Company (China), SIR Industriale (Italy), Emerald Performance Material (US), Nagase America Corporation (US), and Huntsman Corporation (US). These companies have adopted various organic as well as inorganic growth strategies between 2012 and 2018 to strengthen their positions in the market. 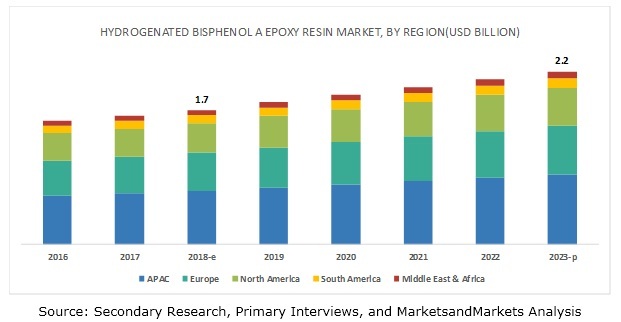 Investment & expansion was among the key growth strategies adopted by these leading players to enhance their regional presence and meet the growing demand for HBPA epoxy resin from emerging economies. In June 2016, Hexion Inc. expanded its R&D facility. A new analytical laboratory was added to its technology & business center in Stafford, Texas. The expansion caters to the increasing demand for chromatography, spectroscopy, rheology, microscopy, and materials in Hexion's epoxy, phenolic, and coating resins and forest products divisions. In August 2013, Aditya Birla Chemical expanded its epoxy resin manufacturing plant capacity in Gujarat, India. This expansion helped the company fulfill the epoxy resin demand in India. In August 2013, Kukdo Chemicals expanded its epoxy resin plant capacity in Kunshan (South Korea). With this expansion, the factory was expected to reach an annual production capacity of 120,000 tons. The company is aiming to fulfill the epoxy resin requirement of China. Are there any upcoming hot bets for the HBPA epoxy resin market? How are the market dynamics for different types of HBPA epoxy resin? What are the upcoming opportunities for different types of HBPA epoxy resin in emerging economies? What are the significant trends in the end-use industries that are influencing the HBPA epoxy resin market? Who are the major manufacturers of HBPA epoxy resin? What are the factors governing the HBPA epoxy resin market in each region? The study has involved four major activities in estimating the current market size of HBPA epoxy resin. Exhaustive secondary research was carried out to collect information on the market, peer market, and parent market. The next step was to validate these findings, assumptions, and sizing with industry experts across the value chain through primary research. Both top-down and bottom-up approaches were employed to estimate the complete market size. After that, the market breakdown and data triangulation methodologies were used to estimate the market size of segments and subsegments. In the secondary research process, various secondary sources, such as Hoovers and Bloomberg BusinessWeek, were referred to for identifying and collecting information for this study. These secondary sources included annual reports, press releases & investor presentations of companies, white papers, certified publications, articles by recognized authors, gold standard & silver standard websites, regulatory bodies, and databases. After arriving at the overall market size-using the market size estimation processes explained above—the market was split into several segments and subsegments. In order to complete the overall market engineering process and arrive at the exact statistics of each market segment and subsegment, the data triangulation and market breakdown procedures were employed, wherever applicable. Data was triangulated by studying various factors and trends from both, the demand and supply sides. *Core competencies of companies are determined in terms of their key developments, SWOT analysis, and key strategies adopted by them to sustain in the market. This research report categorizes the HBPA epoxy resin market based on physical form, application, and region.